SUMMARY: The Community Service Officer position is a non-sworn position designed to assist the Patrol Division by performing tasks that allow the Police Officers the opportunity to better provide police services for the City of Rapid City. A&W Janitorial, a family owned professional cleaning service, looking for highly motivated, detail oriented cleaners. Competitive wages begin at $12.00 per hour and increases based qualifications and experience. 401K benefits! Job openings for early weeknights keeping your weekends open! Background check required – No felons accepted. For more details call (605) 393-2314 and leave a message. Inverness Technologies, Inc. is accepting resumes for a part-time Career Transition Workshop Facilitator/Trainer at Ellsworth AFB, SD for the Department of Labor Employment Workshop. Trainers conduct workshops for separating and retiring military personnel and spouses who are transitioning from the military into the civilian job market. Successful candidate will facilitate approximately 1 workshop every month at Ellsworth AFB; additional workshops are available if willing to travel within the northeast region. Each workshop is 3 days in length (weekday, daytime hours). Recruitment is limited to the local commuting area, within 50 miles of Ellsworth AFB. 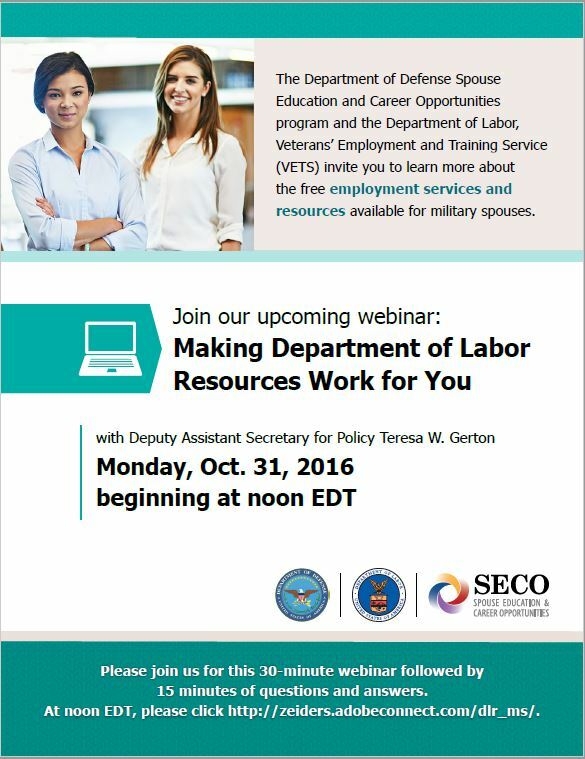 This could be an excellent opportunity for military spouses or veterans living in the area. Candidates must have previous experience in Training, Career Counseling or Human Resources.  Comprehensive understanding of the U.S. labor market and public and private sector employment practices.  Bachelor’s degree in Training, Education, Career Counseling or HR strongly preferred; Education requirement can be waived with 3+ years of experience in facilitation/training.  Three years’ experience as a trainer/facilitator. Experience delivering job search workshops is preferred.  Interactive, dynamic and energetic training style necessary to engage this military audience in job search training activities. A training demonstration will be required as part of the interview.  Knowledge of the military and experience working with military clients is strongly preferred.  Must have ID card to enter US military bases and buildings.  Must own a computer, have email capability and have experience using Microsoft PowerPoint. CLOSING DATE: This position will close on November 3, 2016. PRIMARY FUNCTION: Competently handle all of the major billing duties for residential customers with minimal supervision. Explain gas, electric and non-utility billing procedures. Create Service Investigation Orders for high/low usage, misreads, diversions, non-registering meters, meter changes, meters not set for billing, too many estimates, damaged meters, etc., to resolve billing discrepancies. Complete requests to change rates. Permanently except customers from late payment charges. Handle errors on active accounts that have not billed in 90 days and active measuring component not billed reports. Process residential billing related CC’s. Supervise projects and provide strong customer service to internal customers. Previous utility background preferred, but not required. Bachelor’s Degree or Associate Degree in business or accounting preferred or equivalent work related experience would be considered in lieu of a degree. Excellent verbal and written communication and presentation skills. Ability to communicate to a wide customer base. Ability to be effective in a fast-paced environment. Strong interpersonal skills with a focus on customer service, both internal and external. Performs responsibilities as directed within determined time frames and with a high degree of accuracy. Ability to work in a team environment sharing common goals and expectations. We offer an attractive salary based on qualifications with competitive benefits and a supportive professional work environment.